Why Have Custom Glass Shower Doors Installed? Some of you reading this are probably building your new home and finally getting that dream bathroom you’ve always wanted. Others are remodeling your home one room at a time and it’s finally time to upgrade your bathroom. Either way, you’ll want to consider hiring a professional glass company so that your custom bathroom has the perfect shower doors that complement the space. We’re sure you’re taking your time picking the perfect vanity, the perfect beveled mirror, and the perfect bathtub that all go together to make your new bathroom look its best. But don’t stop there! You’ll want to get the right shower enclosure, whether you pick from our extensive collection or want something that’s custom made. We’re proud to offer frameless shower doors that look exquisite. Frameless shower doors offer a style like no other type of shower enclosure, and because of their apparent simplicity they fit in with just about any decor. Don’t worry about the durability; frameless shower doors are just as safe as any glass shower door. 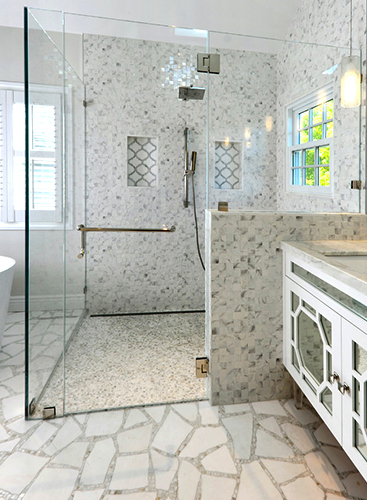 Some shower doors might be frameless, but that doesn’t mean that there isn’t important hardware to pick. We have a great selection of hardware that goes with your shower and tub, including hinges, handles, and supports. No need to settle for the standard hardware when you can enjoy luxury at a great price. No matter what you need, our glass company can get you exactly what you need for your home. Contact Eagle Valley Glass and Mirror today!